The RTC Pi Zero is a battery backed real-time clock module for the Raspberry Pi Zero. It keeps track of the time while the Raspberry Pi is switched off and allows the Raspberry Pi to retrieve the current date and time from the RTC Pi Plus when it is switched back on. The RTC Pi Zero is powered through the host Raspberry Pi using the GPIO port and extended pins on the GPIO connector allow you to stack the RTC Pi Zero along with other expansion boards. The RTC Pi Zero uses the DS1307 RTC real time clock and a CR2032 battery to maintain the date and time when the main system power is not available. The RTC Pi Zero is very useful for standalone projects where your Raspberry Pi will not have a network connection and therefore no way to retrieve the current date and time from the internet. Mounting holes are provided so you can securely bolt the RTC Pi Zero to your Raspberry Pi with our mounting kit (sold separately). 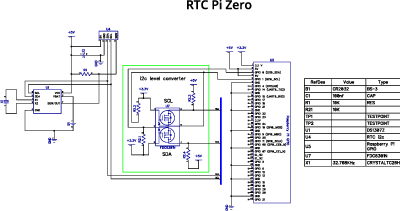 The RTC Pi Zero can also be used on Arduino boards when connected via the I2C bus. Warning: Do not connect the RTC Pi Zero to your Raspberry Pi when the power is connected without a CR2032 battery installed. This can cause damage to the DS1307 RTC chip. Follow our tutorial on how to enable I2C on your Raspberry Pi and set up the real time clock on the RTC Pi Zero. The RTC Pi Zero is supplied with the 40 pin GPIO connector and the battery holder unsoldered. 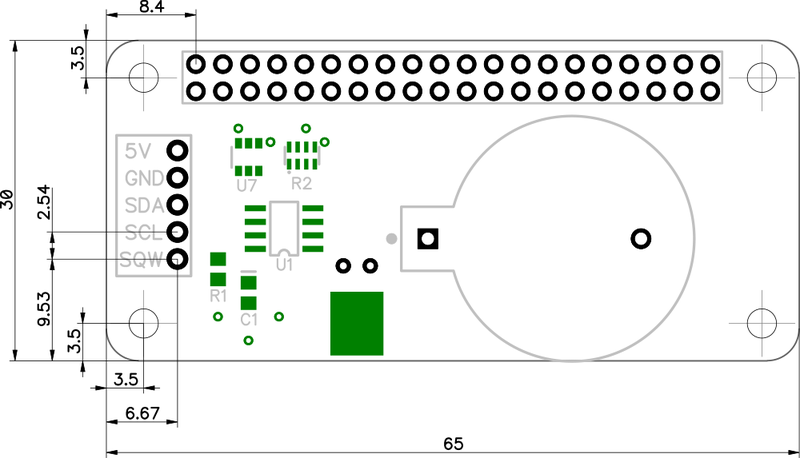 We supply the RTC Pi Zero this way because the Raspberry Pi Zero is also supplied without a GPIO header and the RTC Pi Zero could therefore be fitted both above or below the Raspberry Pi Zero. Before using the RTC Pi Zero you will need to solder the 40 pin GPIO connectors onto the PCB and the battery holder. RTC PiZero addon has a rating of 4.8 stars based on 4 reviews.